Realizing the need for a coffee shop presence in the business school, Council members worked with the administration and neighboring coffee shops to introduce the Method Café. The café is always busy with students taking a study break to enjoy drinks and snacks. During finals week, Leeds Council gives out Cosmo's Pizza to students in order to keep the students motivated. 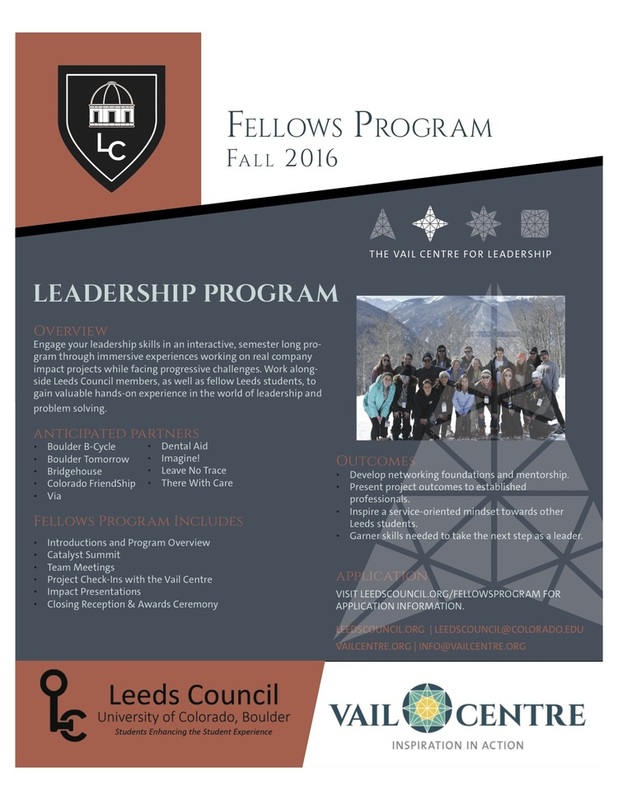 The Fellows Program engaged leadership skills in an interactive, semester long program through immersive experiences working on real company impact projects while facing progressive challenges. Leeds Council members, as well as fellow Leeds students, worked together to gain valuable hands-on-experience in the world of leadership and problem solving. Delivers food and clothing to low income and poverty-stricken children and families. Offers IncrEdibles program: backpacks full of healthy, kid friendly food to low-income kids on the weekends during the school year. Hot Meals on the Street: nutritious meals and clothing to homeless and down-and-out. More than 5,000 meals a year. Mobile Food Pantry: distributes high-quality food to disadvantaged families in Boulder County and victims of natural disasters, abuse, or violent crimes. “Focuses on daily needs of community’s less fortunate”.